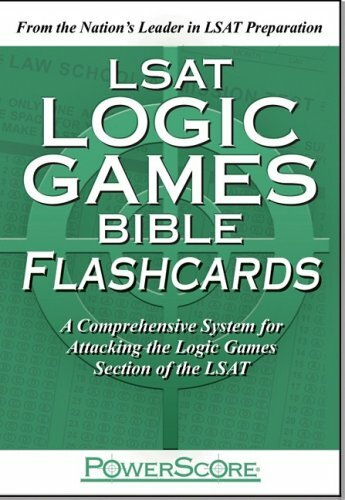 The PowerScore LSAT Logic Games Bible Flashcards are meant to accompany the PowerScore LSAT Logic Games Bible and provide test takers with an ordered and easily referenced means of reviewing the information contained in this groundbreaking book. These cards will help you review and memorize Games terminology, aid you in recognizing game types and rule language, improve your rule diagramming and inference making ability, and allow you to hone your skills with mini-setup challenges. The cards are sized 5 x 3.25 , with the question on the front and a detailed answer on the back. There are 6 categories of questions included on the flashcards: Question Types, Rule Diagramming, Rule Connection/Linkage, Inference Making, Game Scenario Identification, and Strategy/Timing. Some of the cards are quite simple and will test fundamental ideas or basic definitions, while others provide the opportunity for diagramming rules and inferences in a mini-game format. Although the cards review the concepts described in the LSAT Logic Games Bible, they are also an excellent supplement to the PowerScore LSAT courses and several other LSAT publications. Use this portable and concise preparation aid to study at the office, on the bus, at home, or anywhere you go.